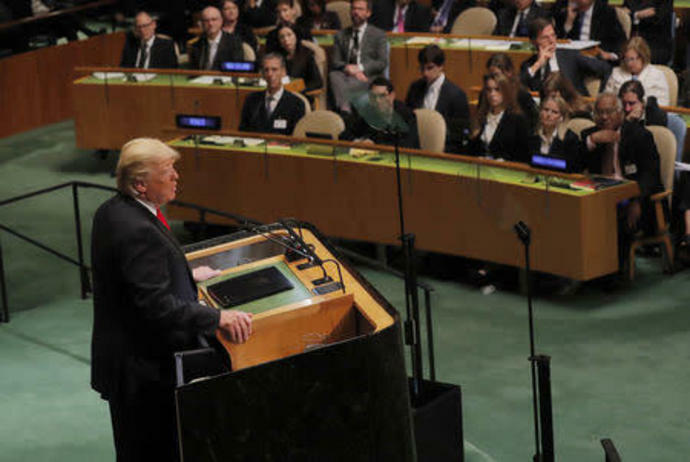 NEW YORK (Reuters) - U.S. President Donald Trump used his annual address to the United Nations on Tuesday to attack Iran's "corrupt dictatorship," praise last year's bogeyman North Korea and lay down a defiant message that he will reject globalism and protect American interests. Trump's 35-minute address was met largely by silence from world leaders still not comfortable with go-it-alone views that have strained U.S. relationships with traditional allies worldwide. His speech, while delivered in a low-key fashion, was nonetheless a thunderous recitation of his "America First" policies. He has disrupted the world order by withdrawing the United States from the Iran nuclear deal and the Paris climate accord, and threatened to punish NATO nations for not paying more for their common defense. "Moving forward, we are only going to give foreign aid to those who respect us and, frankly, are our friends. And we expect other countries to pay their fair share for the cost of their defense," he said. "I do not accept the erosion of multilateralism and don't accept our history unraveling," Macron told the assembly at times raising his voice. "Our children are watching." Trump aimed much of his remarks squarely at Iran and its "corrupt dictatorship," which the United States accuses of harboring nuclear ambitions and fomenting instability in the Middle East through its support for militant groups in Syria, Lebanon and Yemen. In May, Republican Trump withdrew the United States from the 2015 international deal to put curbs on Iran's nuclear program in exchange for easing sanctions. Foes for decades, Washington and Tehran have been increasingly at odds since May. The accord with OPEC member Iran was negotiated under Democratic U.S. President Barack Obama. A Gulf diplomat said in response that "we have been doing our fair share of burden sharing." Trump's main message was aimed at Iran and attempting to drive a wedge between its leadership and its people, days after an attack in southwestern Iran on a military parade killed 25 people and unsettled the country. In remarks to reporters on his way to his speech, Trump said he would not meet the Iranians until they "change their tune." He held out the possibility of a better relationship in the future. Alireza Miryousefi, spokesman for Iran's U.N. mission, told Reuters that Iran has not requested a meeting with Trump.